Patients of all ages should visit the dentist at least every six months, as recommended by the American Dental Association and Dr. Sapienza. During this preventive visit, your dentist in Park Slope and his team will rid your teeth and gums of the plaque, tartar, and bacteria that cause oral issues. Then, your dentist will examine your mouth for tooth decay, gum disease, worn dental work, and other problems requiring treatment. When you stay on top of these regular visits, we really get to know you and your smile. That means we are more likely to notice small changes that indicate the presence of more serious conditions, like oral cancer. Early detection greatly increases the chance of successful treatment of this disease. Six month checkups and cleanings are also key to preventing gum disease, the condition that affects the majority of American adults. Left untreated, gum disease has been linked to high blood pressure, heart disease, uncontrolled diabetes, and pregnancy complications. But when caught early, gum disease is easy to treat and reverse. In addition to visiting your Park Slope dentist twice each year, make sure you are maintaining good hygiene habits at home. Brush your teeth for two minutes, twice a day, and floss your teeth daily. Maintain a nutritious diet and give up tobacco to enjoy your healthy teeth for a lifetime. The earlier we can catch spots of tooth decay, the better. Small cavities are easily treated, sometimes without the need of anesthesia. And if we spot a weak area of enamel before it turns into a cavity, we can even intervene before you need a filling at all. Digital x-rays, intraoral photography, and special cavity detection software give Dr. Sapienza an in-depth look at your teeth and surrounding oral structures. Gum disease, infection, abscess, pre-cancer and cancer are all made visible with digital technologies. In addition to giving us a better look inside your mouth, digital radiography greatly reduces your exposure to radiation -- by as much as 90 percent compared to traditional x-rays. We can also pull the images up on a screen right beside your chair, so you get a better idea of what’s going on inside your mouth. The Dental Spa of New York offers a full list of services, but in the rare case that we need to refer you to a specialist, we can easily send your digital records to outside offices without worry they will get lost or mixed up somewhere along the way. But the biggest advantage of digital x-rays? The fact that early detection of oral problems saves you time, stress, and money with quick, efficient treatment. Because we know healthy smiles require preventive care and early detection, Dr. Sapienza and team place a special emphasis on this area of dentistry. We remind you to stay on top of your six month checkups and cleanings. With digital x-rays and gentle cleaning methods in our spa-like environment, we know you’ll find it to be a relaxing experience. When was your last visit to the dentist? 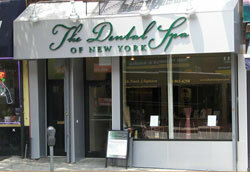 We invite you to request an appointment at The Dental Spa of New York today!